Reflecting telescopes. 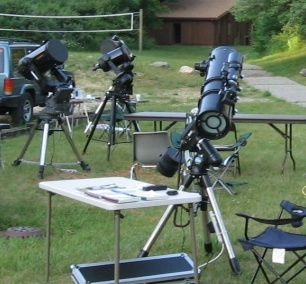 The two on the left are Cassegrains, the larger one on the left is a Newtonian. Reflectors use a big mirror to collect the light. The biggest reason for using mirrors is because you can support the entire back side of the mirror (note the ring-style support on the Newtonian in the picture at left), which means it is possible to build truly huge mirrors. In fact some of the professional telescopes have flexible mirrors and computer controlled struts that can help correct for atmospheric turbulence. Some other advantages to this is that no light is absorbed by the mirror (as much as 4% of the light can be reflected at every surface with lenses, and some light is absorbed as it passes through the lens.) Many reflectors are also a “folded” type, which makes them much shorter. Additionally, there are ways to correct the problems with mirrors without using really long focal lengths, which also makes the tubes shorter. All reflectors must have a primary mirror to collect the light (obviously – that’s why they’re called reflectors!) After that, you can get all sorts of strange configurations. Many of the configurations are designed to solve problems, so lets start with that. Spherical aberration occurs because the light from the outside comes to a slightly different focus than the light coming in close to the center. Spherical aberration occurs when spherical mirrors are used. It looks the same as spherical aberration in refractors, and the cause is similar. Light hitting near the edge of the mirror focuses to a slightly different point than the light coming in close to the center. There are a couple possible solutions to this. One solution is the same as one of the solutions for refractors: use a mirror with a really long focal length. Of course one of the reasons for using mirrors is so you don’t need a really long OTA. Mirror Shapes. The black line represents the cross-section of a spherical mirror, the red line a hyperbolic mirror, and the blue a parabolic mirror. The best solution is to use a hyperbolic mirror. A hyperbolic mirror is a solid of revolution, with the shape of a hyperbola, a conic section that is curved at the center and the edges diverge forever. However, making a hyperbolic mirror that is perfect is hard, which also makes it expensive. The best known hyperbolic mirror is the primary in the Hubble Space telescope. That mirror was made with a small error in the shape, so corrective optics ( frequently refered to as “eyeglasses”) had to be added to all the instruments, many of which had to be replaced. However, even before the instruments were fixed, Hubble was a better telescope than anything on the ground at that time. You can also design a corrector plate that bends the light slightly as it enters the ‘scope so that the light ultimately all comes to the same focus. This of course adds a lens back into the system, so some of the advantages like light loss are added back as well. However, it is a much cheaper alternative to hyperbolic mirrors. Coma occurs because the light coming in from off-axis does not focus at a single point. Parabolic mirrors do not suffer from spherical aberration, and are easier/cheaper to make than hyperbolic mirrors, so they are a good alternative to spherical mirrors. If you are viewing something near the center of the field of view, they are great. If you look off-center, the stars may appear elongated, almost comet like. There is a nice image of the Orion nebula with coma at http://portableastronomy.com/i-cubed.htm. Coma occurs because light coming in to a parabolic mirror from a little off-center doesn’t come to a nice focus. Instead it focuses in more of a line, with a sharp edge close to the center. The simplest possible reflector, the prime focus has no secondary mirror. It is just a large primary and with an equipment package at the focal point. The best prime focus telescopes use hyperbolic mirrors. Most professional telescopes are this type (see for example, the popular picture of Edwin Hubble in the observer’s cage at Palomar.) However, they are a really impractical design for amateurs. Unless you happen to be a really really wealthy amateur. Light enters the telescope and reflects off the primary on the right. It then reflects off the secondary and exits the eyepiece at the top. The first reflecting telescopes were designed by Issac Newton, around the same time he was experimenting with poking himself in the eye (section 58 – not for the faint of heart!) Newton realized he could use a large mirror instead of a lens to collect the light, then place a plane mirror just before the focal point to direct the light off to the side where he could observe it. Newton’s first telescope used a spherical mirror, but he changed his design after Christiaan Huygens suggested that he use a parabolic mirror to avoid spherical aberration, so maybe it would be better to call it a Huygens-Newtonian telescope. The standard Newtonian telescope is a parabollic primary mirror with a plain secondary mirror angled at 45º so the light exits out the side of the telescope. The secondary is placed just short of the focal length of the primary, so the length of the OTA is roughly the focal length of the primary. Since coma gets worse the farther off-center the object is, most Newtonians are relatively narrow. Also, since the OTA has to be roughly the focal length of the primary, they tend to be shorter focal length mirrors, which also helps reduce coma. 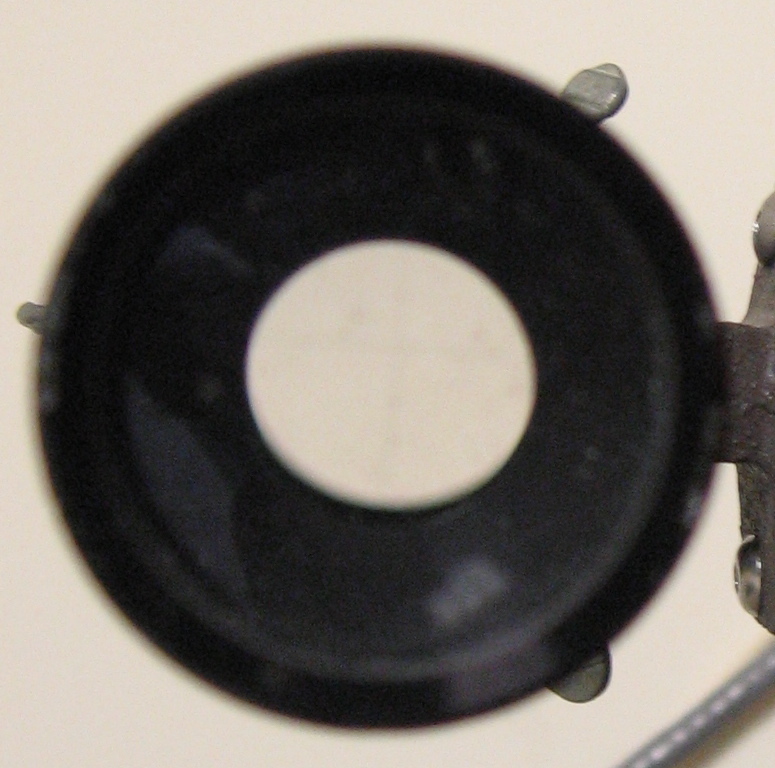 The eyepiece of a Newtonian is at the top of the tube, which makes them ideal for alt-az and particularly Dobsonian style mounts. Some of them (frequently reffered to as “Dobzillas”) are big enough to need ladders. See for example http://samples.briskbuild.biz/deepskyranch/dobzie/dobzie.html, http://www.flickr.com/photos/25411368@N07/3302802968/, and http://www.cruxis.com/scope/scope1070.htm. A Schmidt-Cassegrain telescope. Light passes through the corrector plate (see below), reflects off the primary, then the secondary, and exits through a hole in the primary. At about the same time Newton was designing his telescope, a Frenchman named Cassegrain was designing a different reflecting telescope. His design used a concave primary and a convex secondary to send the light back out a hole in the primary. This folded up design made for a short tube, and the eyepiece out the back would have made the telescope easier to point. However it took some time before the design caught on, probably because Newton and Huygens absolutely trashed the design. The major problem of the Cassegrain telescope is that it relies on two spherical mirrors. 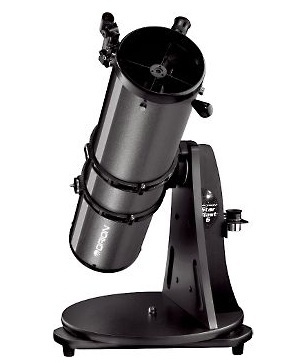 To really have a good Cassegrain telescope, you need some sort of corrective optics. With modern materials however, a corrector plate is relatively easy to make, and Schmidt-Cassegrain and Maksutov-Cassegrain are now very common amateur ‘scopes. Modern Cassegrains have many advantages. They are compact, with OTAs much shorter than the focal length, which makes them highly portable. 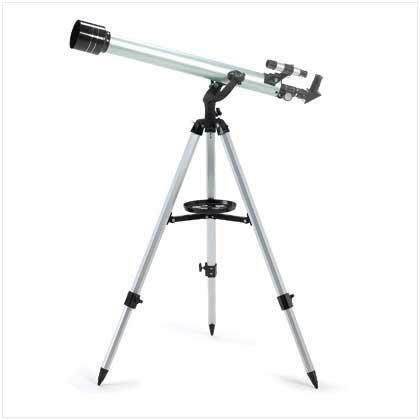 Since the eyepiece is out the back, it some people find it easier to point the telescope, and the telescopes can be mounted on equatorial mounts without worrying about where the eyepiece might end up (except if you want to look toward the north celestial pole.) They are also easy to balance if you want to add heavy equipment like a camera. Light enters through the corrector plate, reflects off the primary at the right, and focuses on (usually) a photographic plate in the middle. The Newtonian and Cassegrain telescopes (and Galilean and Keplerian refractors) were invented in the 17th century. Astronomers had to wait until the 20th century for the next real leap in telescope technology, when optician Bernhard Schmidt invented a corrector plate that could correct spherical aberration. The simplest Schmidt telescope is the Schmidt camera, which is basically a prime focus telescope with a spherical mirror and corrector plate. In the mid-20th century many professional observatories built a Schmidt camera for large photographic surveys. In the 1960s Tom Johnson developed a method of mass-manufacturing a good quality Schmidt-Cassegrain telescope. It became the Celestron orange-tube (which I am very familiar with.) Since then, the Schmidt-Cassegrain has become a very popular design for amateur telescopes. A Maksutov-Cassegrain telescope. Light passes through the meniscus corrector, reflects off the primary, then off the aluminized spot on the corrector and out through a hole in the middle of the primary. Just a few years after Schmidt, a Russian named Maksutov designed a Cassegrain style telescope with a simpler corrector plate. The Maksutov corrector plate is a simple meniscus, with an aluminized spot on the inside to act as the secondary. This eliminates any problems of having to mount the secondary mirror. However, the corrector plate is limited in how much correction it can do, so the focal length of a Maksutov-Cassegrain is generally fairly long. Also, the field of view tends to be smaller than an equivalent Schmidt-Cassegrain. In the 1960s, Questar made a beautiful (but expensive) Mak-Cass telescope, which is now a coveted collector’s item. Recently, some very compact, lightweight, and much less expensive mak-cass telescopes have made this a popular design again.